Matthew Labarge ushered in December with a new set of songs for all the instrumental piano lovers to enjoy. Spiriti is his sixth proper release. When I saw Matthew’s name come up I found an instant recognition within my memory. In 2013 one of my staff members covered Larkenlyre’s Extraordinary Voyage. I have an amazing recollection of music and I wish I could apply that to daily life with the small things. Music is at the top of list for importance and that is the reason why I remember so well. Music is my savior, my own slice of heaven on earth that I can turn to time and time again and get the results I am looking for. In the case of Spiriti, knowing what to expect before I started was a bonus. I knew exactly what I would be looking for. This is music to soothe the mind, body and spirit - the three most prolific parts of what makes us all human. Somehow, I feel more in touch with who I am and my relationship with humanity when I am “alone” listening to music. Which is kind of a paradox but it works. Matthew has some shorter tracks on this release and some real stretches of ivory wizardry to offer a listener. For instance, the closing track “Love Song” is over 9 minutes long. I do believe there is some magic in this music. Silence is golden but it becomes an enhanced experience while listening to the singularity of a piano played by musician that is one with his instrument. This music is gentle and expressive in the same breath which I ultimately find very attractive. 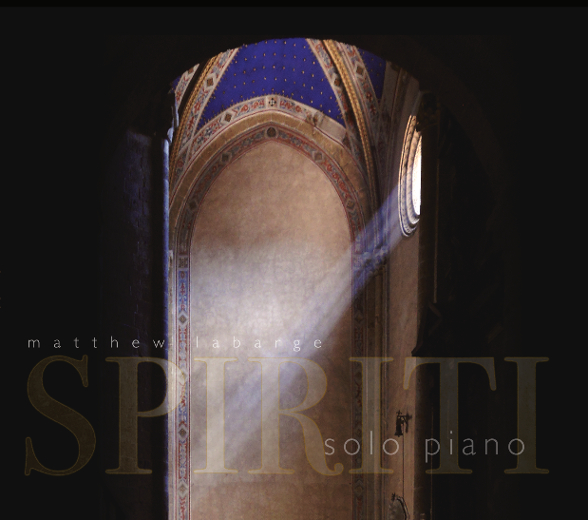 Matthew’s Spiriti is a man channeling his own spirit to his fingers directly to our senses. It is such a gift to play music in such an emotive way. It moved me gracefully and effectively, something I have learned to respect and appreciate more over the years. This is 12 tracks yet it is so seamless that it felt like one ever changing piece if music. This music offers healing sounds for those in need and simple relaxation and enjoyment. It is all dependent on your needs and it just may help you along your way to a new day.